Britax Kidfix II XP Car Seat is a Group 2/3 Car Seat that will last your child from tot to pre-teen, supporting them on every journey. Featuring the XP-PAD as well as SecureGuard technology, you will have that extra peace of mind while travelling! Why should I choose the Britax Kidfix II XP Car Seat? The Britax Kidfix II XP Car Seat is a forward facing Group 2/3 Car Seat which is suitable from 15 to 36kg (or approx. 4 to 12 years in old money). This complete suit of armour features an XP-PAD, which gives the very best protection in the unlikely event of a frontal impact. This is because it diverts up to 30% of the energy force away from your child's neck. It's made from advanced shock absorbing foam, too. Now that's definitely what you want in a car seat! This high back booster seat achieves absolutely optimal lap belt positioning with the latest SecureGuard technology (patent pending). This SecureGuard helps to shield your little monster's delicate abdominal area by adding an fourth contact point to the 3-point seat belt - now that's super! 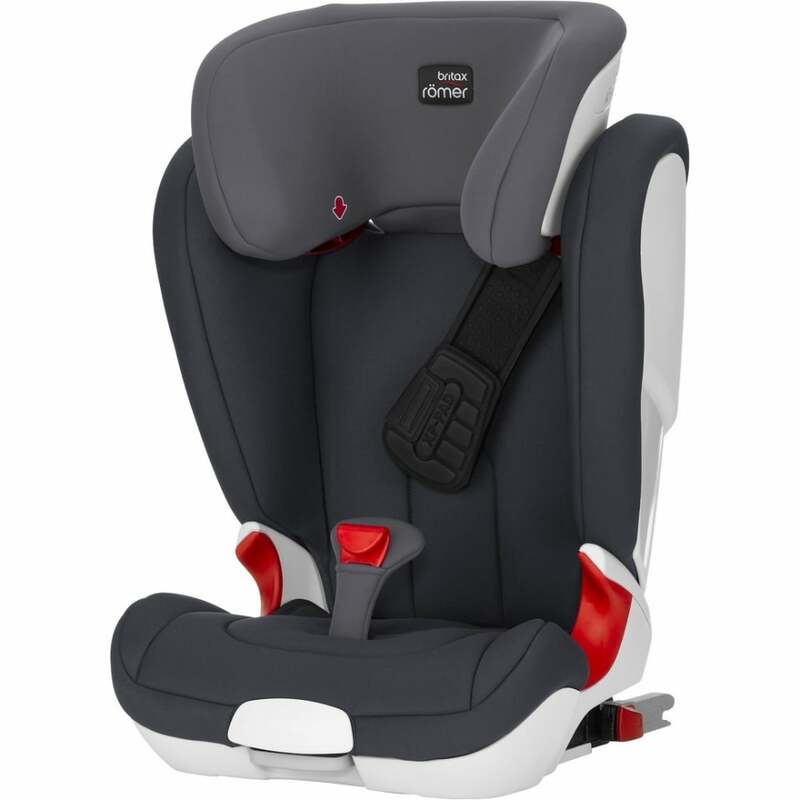 Your child will have additional protection in this car seat from Britax with its deep and padded wings. This also provides head and neck support, ensuring complete comfort and pristine protection. The headrest has been specifically designed for older kiddo's. It has been ergonomically designed to support your child's head when they doze off to dreamland! This means you won't have to worry about their head falling to the side when you're going round a sharp bend. Plus, the headrest and upper belt guide are adjustable. This allows the seat to grow with your child through the years! The backrest of this car seat is V-shaped, which is designed to give optimum support to your child as they embark on the growth spurt journey. Plus, it automatically adjusts to match the angle of the vehicle seat! Seat belt guides on this Britax Car Seat ensure that your child is definitely strapped in correctly. You can install the Britax Kidfix II XP Car Seat into any car with the 3-point seat belt or your vehicles ISOfix points. Indicators will clearly show you if the ISOfix connectors are fully engaged with your car's anchorage points. This means that safe and correct installation is so simple. Last but not least, the cover of this Group 2/3 Car Seat is completely removable. This is fantastic for those messy days when drinks are getting spilled and dirt is wiped everywhere. Just take it off and whack it in the washing machine! This means that you can get on with your day. What are the specifications of the Britax Kidfix II XP Car Seat? Is there a Manufacturers Warranty included with the Britax Kidfix II XP Car Seat? Britax offer a 2 year Manufacturers Warranty against manufacturing or material defects (excludes polystyrene inserts). This applies to UK Mainland only. Your Review - Britax are a good make and we've found this car seat to be great. It's isofix so easy to install. It's easy enough to buckle our child in and the additional strap keeps it away from her neck. Delivery was great too, came when expected.